Boho Florals | Is This Mutton? "Boho florals" - brightly colored florals, often in the form of embroidery, and on a black background, are everywhere. I got this dress from Marks and Spencer a few weeks ago with a view to wearing it on Mother's Day when we always go put for lunch. M&S also have a slightly different version in separates: half-sleeve top and A line skirt. 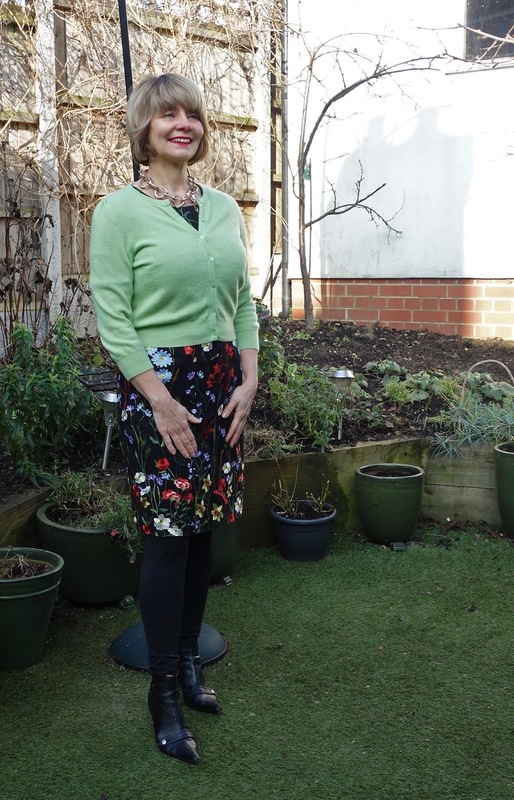 I first tried it on with sheer black tights, thinking this would look lighter for spring, but I think the dress needs solids otherwise it looks fuddy duddy, so I added leggings, ankle boots and a cropped cashmere cardi plus a chunky necklace from Topshop. The picture at the bottom shows me wearing it "straight" with a belt, the sheer tights and Mary Janes, and I think it looks just awful. I have been mugged by flowers! I actually like the dress a lot, and I think you look great, but you have to feel comfortable! I have a floral dress, and I like it most with a black sweater over it (which I just realized "hides" some of the flowers...). So what are you going to wear on Mother's Day now? That's a good question Andrea! I like the dress but only with the cardigan and leggings, and it'll soon be too hot for them. For Mother's Day I have high hopes of a new Ted Baker top in maroon....stay tooned! Wow---I'm so surprised you didn't like the dress, Gail! The sleeves give it a little flair and the flowers look nice! In fact, I don't think they are overpowering at all--maybe because of the black background. So surprised you sent it back! Love this dress, the mesh sleeves are gorgeous. It's a pretty dress...but with summer approaching I didn't like it worn on its own. Maybe I should get the skirt....! Thanks for linking up to Top of the World Style. I first thought you are wearing a skirt. Very nice dress! Very nice outfit! I think that's a lovely dress. I love how you styled it and think it would look lovely on it's own minus the stockings and with different footwear. You would probably get a different perception of it if you took photos in a different location too. 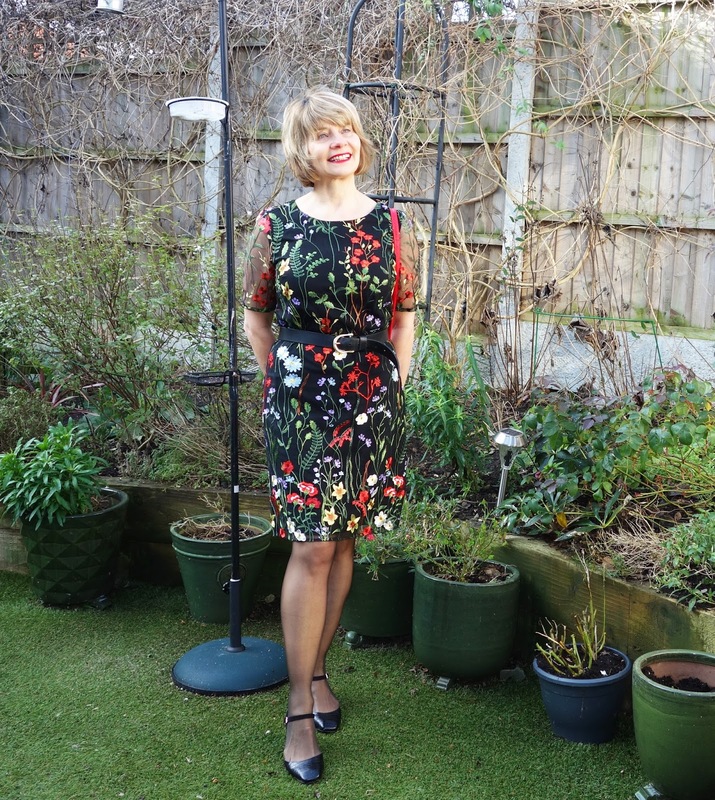 I am partial to florals myself but it is you that needs to feel awesome in the dress. If you're not feeling it you did the right thing. The dress is pretty enough, but not very enthralling if you were in doubt enough to send it back Gail. Sheer tights and belt were the deciding factor for me - send it back! I love how you've dampened down the floral with the plain cardigan. It really works. 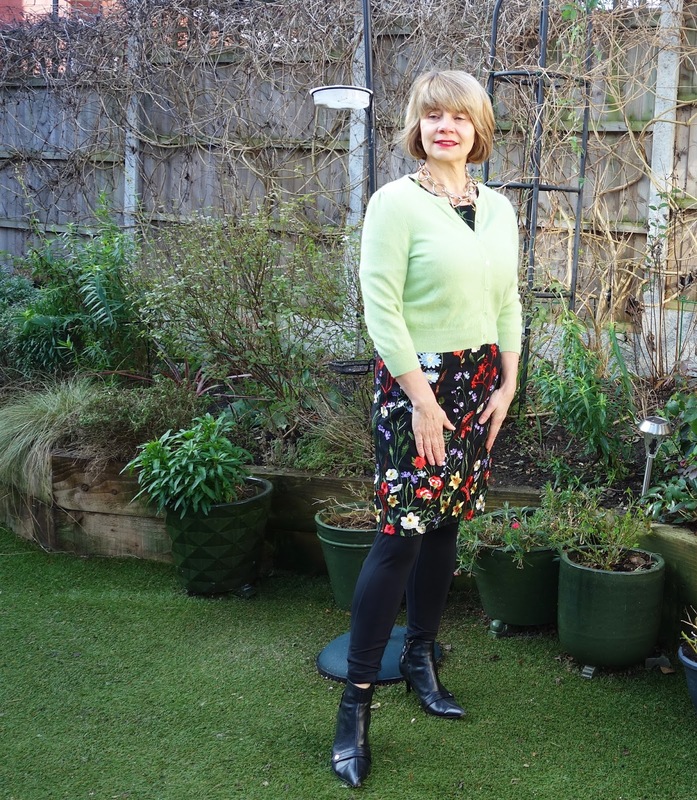 Spring like too in the lighter cardigan colour.